Kaz and Tora are in a bad place in the season finale of Star Wars Resistance. 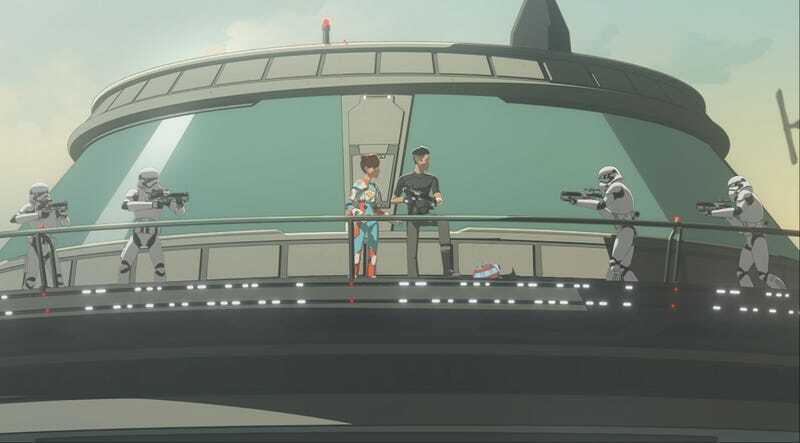 The first season of Star Wars Resistance ended Sunday night with a dogfight for the ages. Kaz and his friends took to the skies in an all-out battle to liberate the Colossus from the First Order, all while being mindful that the galaxy as they know it has completely changed with the recent destruction of the New Republic. Once it was over, io9 got on the phone with one of the executive producers of the animated series, Justin Ridge, to answer your burning questions about why certain things happened, how the show ties into the movies, when season two may be set, what to expect when we get there, and so much more. Neeku left season one with a major question: Where is the Colossus going? Agent Tierney’s plan worked and Tam is now with the First Order. io9: Was Von Reg (the Red First Order pilot) always set up to just be killed by Kaz? Was his fate always sealed? Ridge: Yes. It was important for us to have Kaz have a big win at the end of the season. He got thrown into this chaos basically in the very first episode, never running into anyone like Von Reg before in his life and almost getting killed by him. And we really wanted to bookend the season and show his progress. His skills as a pilot, that he’s matured, that he’s determined to try and save the Colossus, so it’s very important for us that he had that win and take down Von Reg. You’d imagine Flix and Orka won’t be too happy about the Colossus moving. io9: It’s nice that Kaz saved the Colossus from the First Order, but there are a lot of people on the Colossus who can’t be happy about leaving Castilon. Will their reactions play into season two? Ridge: Yeah, we will definitely address that as we go into season two, but you’re totally right. Team Fireball aren’t the only ones on the ship. There are lots of other citizens and other people who need the Colossus to survive. Like that’s where their business is and now that they are uprooted off Castilon and headed elsewhere we will definitely get a sense of that as we go into season two. io9: How does the show change now that the Colossus is mobile and on the run from the First Order? Ridge: Again I don’t want to spoil too much but it does add a different dynamic. We’re no longer grounded, the First Order is coming towards them...now they’re on the run and we get to see what that entails and what kind of adventures come from that. There’s more emo Kaz to come, especially after losing his family. io9: Will the fallout of losing his family be a major through-line for Kaz moving ahead? Ridge: Oh yeah. It’s definitely something that Kaz has to deal with. It’s such a huge event and really such a devastating thing that happened. We’ll definitely see how Kaz handles it. io9: Was the plan always to join the movie timeline at the end of the first season? Ridge: Yes. Early on we knew [The Force Awakens] was going to be the big event that ended season one. We knew that not only is it personal for Kaz but it also helped kind of ground where we are in the time frame of the galaxy and the connectivity to the movies as well. It was so interesting to see a scene from The Force Awakens turned into animation. io9: How did the decision come about to use Hux’s speech as the connecting moment? Ridge: As an animated series you only have limited assets and things we can show and we couldn’t just use a clip from the movie. But we knew it was very important to convey that something from The Force Awakens was happening. And we were, fortunately, able to do a model of Hux and use his speech from the movie. So we knew we wanted to show somehow the events of The Force Awakens and we thought this was the best way to do it while still on the Colossus. io9: Were there any particular challenges veering the show so close to the movies? Ridge: There were a lot of challenges, to be truthful. We were going into a period that hasn’t really been delved into that much. And thank goodness for people like Pablo [Hidalgo] and Leland [Chee] of our story group because they’ve really helped us to stay grounded with all the different puzzle pieces that are happening within Star Wars. Making sure that we are not crossing into territory that we shouldn’t or making sure that the events are congruent with everything else that’s happening. So that was definitely a challenge as we were writing the stories. But I think we stayed on track. Who knows if we’ll see Poe again in Resistance? io9: Since The Last Jedi takes place immediately after The Force Awakens, and Resistance season two premieres before Episode IX in the Fall, could Resistance be the first thing we see in a post-Last Jedi world? Ridge: That’s an interesting observation. We’ll have to wait and see. io9: I felt like the Aces got a bit short-changed this season, will they be a larger part of things moving forward? Ridge: They definitely will play a bigger part in season two. It’s tricky. We have a lot of characters on this station and in our story so to give everyone equal screen time is kind of impossible. So when we write these stories we just organically want to make sure that it feels right and that we’re telling the right story. And sometimes we don’t get to see as much of the Aces as we’d like but you’ll definitely see them in season two. More Aces in season two! io9: Now that season one is over, what are your general feelings toward it? What things do you think were done particularly well? Are there things you could have done better? Ridge: I have to say I’m so impressed and proud of our entire team and the amount of stuff we were able to do in season one. Even though we were basically on this platform for most of the season we had different adventures. Like when Kaz went out with Poe flying around and things like that. The team was able to make the show feel epic in its own way which I’m happy we were able to do. I think as an artist there are always things you can look at and nitpick and be like “Oh we could have done that” or “Could’ve done this.” But I think overall with the time frame that we were given, and the timeline as well leading up to The Force Awakens, I’m just so thrilled with what we’ve done so far. And seeing the audience’s reaction to it it’s been fantastic. With Dave Filoni working on The Mandalorian, does he still have time for Resistance? io9: With series creator Dave Filoni off working on The Mandalorian, has his creative involvement with Resistance changed from the beginning of season one until now? Ridge: He is indeed a very busy guy. And I can’t wait to see The Mandalorian. He won’t even show us the stuff he’s working on. But, no, he still, despite all of the stuff that he’s doing, has a presence on the show. He still checks in with us and reviews reels and gives us his notes and things. So he’s definitely present on the show despite all the other stuff he’s doing. io9: Finally, how is season two going to be different than season one? Ridge: Well, I think the dynamic overall is different because now they’re on the run. And I think audiences will be able to get a bigger idea of some of the things that are out there in the galaxy as they’re being chased, possibly, by the First Order. So I think there are going to be a lot of fun new things that people haven’t seen before, without saying too much. I’m excited for everyone to watch it. Star Wars Resistance returns for season two on Disney Channel sometime this fall.